Chechen leader Ramzan Kadyrov has reportedly taken to the airwaves to lecture gossipers who, according to him, used WhatsApp messenger to ridicule the “wedding of the century” between a middle-aged police chief and a 17-year-old bride, local media says. The gossipers in question were caught discussing the controversial wedding between Nazhud Guchigov, a 46-year-old police commander in Nozhay-Yurtovsky district, and a 17-year-old girl named Kheda (Louisa) Goylabiyeva, local Grozny TV channel reported. “Be Chechens, think of your children. Family honor is the most important thing, don’t let anyone slander it. Don’t write in WhatsApp. Men, make your women leave the [WhatsApp] groups,” he said. 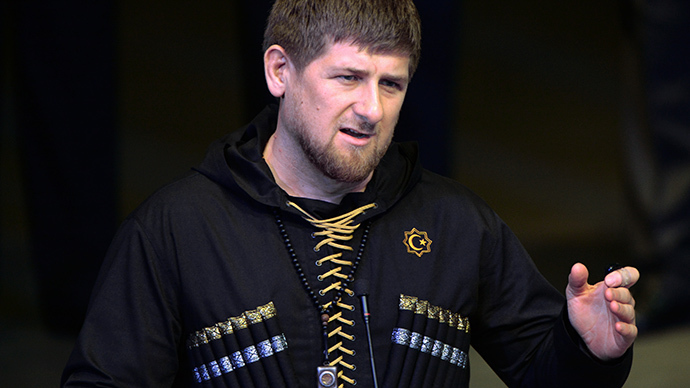 The Chechen channel aired Kadyrov’s chiding as a video of it was recorded and later posted online. On Thursday, Kadyrov, himself an avid Instagram user, posted his criticism of social media for “spreading made-up stories, slandering people” and in this way “misleading the [Chechen] population.” He added that he had discussed the issue with his recently appointed minister of national policy, Djambulat Umarov, and the heads of local TV channels on Tuesday. It is not the first time Kadyrov has taken on WhatsApp. In March, he proposed limiting access to messaging applications and social networks, saying they help spread rumors. “You do not need to display your life to the public. My wife and children do not use social networks, they don’t have separate accounts,” he said. While not exactly unusual for Chechnya, the wedding of the middle-aged man and his teenage bride sparked public outrage after reports in Russian media claimed that Goylabiyeva had been “forced into it.” It was rumoured that she had even been prevented from leaving her home by checkpoints set up by the police chief. Human rights activists cried foul over claims that the family faced threats of reprisals. Moreover, reports said that Guchigov was already married with children. However, family members later denied that there had been any pressure on them, or that they had spoken to the media about the allegations. Goylabiyeva’s mother claimed that she supported her daughter’s will. Kadyrov refuted the claims saying that a trusted individual had visited the bride-to-be and confirmed her and the family’s approval of the arrangement. Before the wedding, Russia’s Human Rights ombudswoman Ella Pamfilova appealed to Pavel Astakhov, Russia’s children’s ombudsman, to look into the circumstances of the wedding. “There are also regions without a minimum established age. In the Caucasus, emancipation and puberty take place earlier, let’s not be prude about this. There are places where women are all wrinkled up by age 27, and by our standards these women look 50. And anyway, the constitution says we can’t interfere in the personal affairs of citizens,” the ombudsman added. Astakhov later had to apologize for his remark on ‘wrinkled women’ as his statement caused further controversy. In response, a petition calling for his resignation was launched on Change.org which had gathered over 33,000 signatures by Wednesday.